Twain’s time­less clas­sic sweeps us down the mighty Mis­sis­sip­pi as the irre­press­ible Huck Finn helps his friend Jim, a slave, escape to free­dom at the mouth of the Ohio Riv­er. Their adven­tures along the way are hilar­i­ous, sus­pense­ful and heart­warm­ing, bring­ing to life your favorite char­ac­ters from the nov­el. Pro­pelled by an award win­ning score from Roger Miller, the king of coun­try music, this jaun­ty jour­ney pro­vides a bril­liant­ly the­atri­cal cel­e­bra­tion of pure Amer­i­cana. 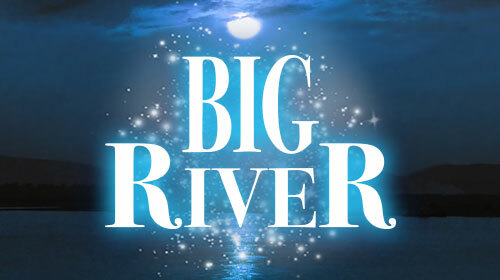 Big Riv­er is pre­sent­ed through spe­cial arrange­ment with the Rodgers and Ham­mer­stein Orga­ni­za­tion.